Feed a family of 5 starting at $7 per person. Each bundle feeds up to 5 people and comes with salad and bread. 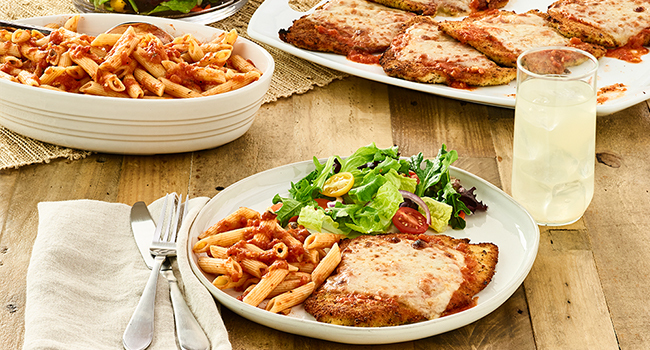 Available for carry-out or delivery* (at select locations). 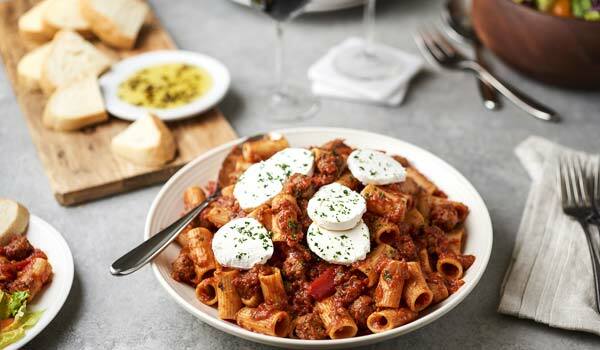 Large rigatoni tossed with Italian sausage, red bell peppers, our Pomodoro sauce, topped with warm caprino cheese. Includes side salad and bread. Feeds up to 5. 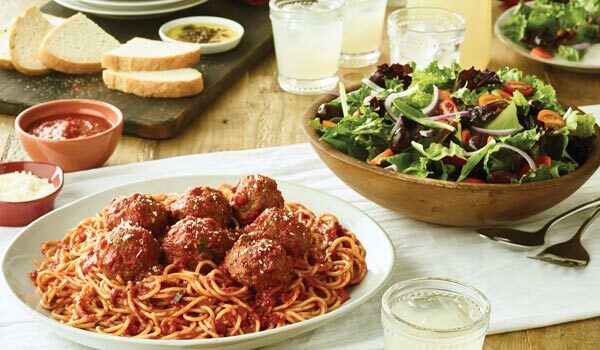 Topped with our pomodoro sauce, bolognese meat sauce or meatballs. Includes salad and bread. Feeds up to 5. 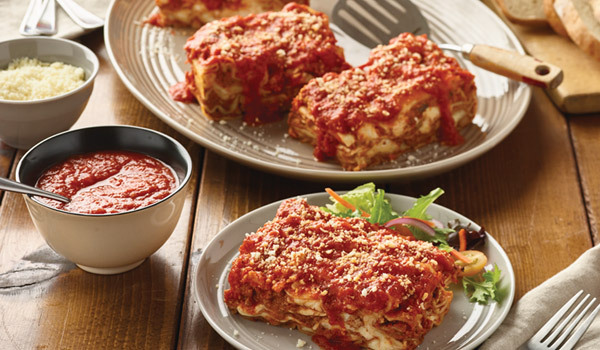 Pasta layered with our pomodoro sauce, meat sauce, ricotta, romano and mozzarella cheese. Includes salad and bread. Please allow 1 hour when ordering this bundle. Feeds up to 5. 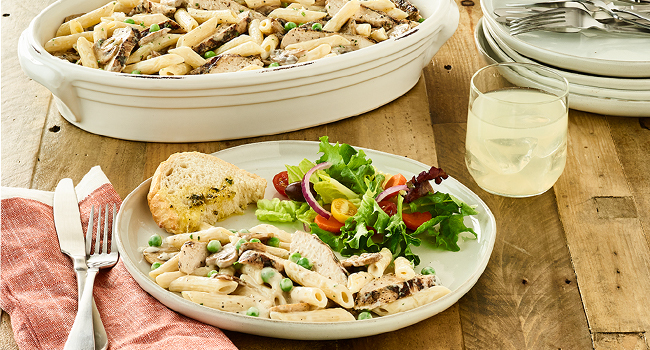 Our made-from-scratch Alfredo tossed with Penne pasta, wood-grilled chicken, sautéed mushrooms and peas. Includes side salad and bread. Feeds up to 5. 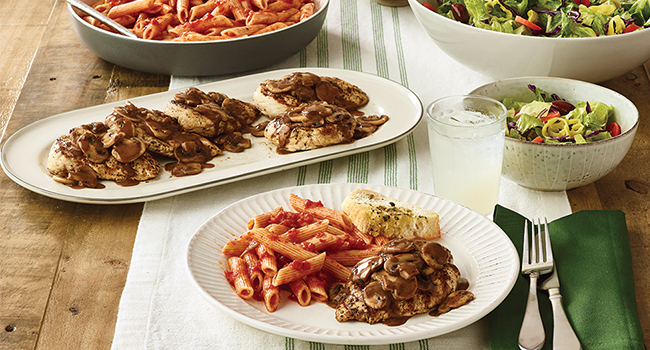 Wood-grilled and topped with mushrooms and our Lombardo Marsala wine sauce. Served with choice of Penne Pomodoro, garlic mashed potatoes, or seasonal vegetable. Includes salad and bread. Feeds up to 5. *Delivery available in select locations. Estimated delivery time will vary. Delivery minimum. Delivery charge and tax may apply. Prices, product participation and restaurant hours may vary by location. Delivery charge is not driver tip. **These items are cooked to order. Consuming raw or undercooked meats, poultry, seafood, shellfish, or eggs which may contain harmful bacteria may increase your risk of foodborne illness, especially if you have certain medical conditions. ***Item contains or may contain nuts.